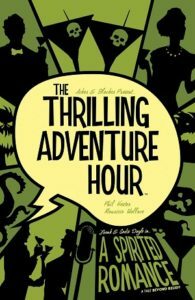 The Thrilling Adventure Hour began as a staged production in 2005, released in podcast form until the final performance in 2015. This comic spin-off collection from BOOM! Studios brings together individual issues originally released in 2015-2016 by Image. This collection continues some of the thrilling adventures for two fan-favourite characters, Frank and Sadie Doyle. Yet, while I was a huge fan, something gets lost in translation from podcast to comic. 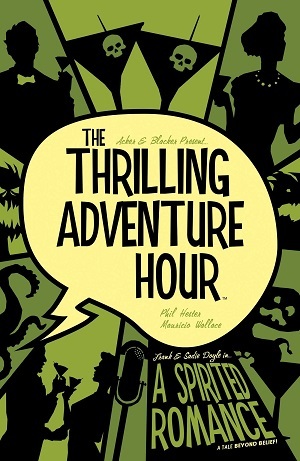 Written by Acker and Blacker, The Thrilling Adventure Hour has a format based on older radio serials. The show subverted the traditional structures, making good-humoured fun of their campy origins. Like the older radio plays, it featured recurring segments. One was “Beyond Belief,” following the hi-jinks of Frank and Sadie Doyle, two high society mediums once described as a drunken Nick and Nora Charles. Frank and Sadie (or Frankenstein and Sadistic, as they playfully called each other) were less interested in spirits of the spooky kind and more intrigued by those of the 40% variety. This mini first gives the reader an origin story for how Frank and Sadie met, an accidental first date involving a fake séance and very real Hellhounds. The story was never played out in the show, so fans should find it satisfying to finally see where their relationship began. After this prologue, the rest of the series focuses upon a plot containing several connected incidents. In it, the Doyles exorcise a house, help a friend deal with a pesky death cult, and assist a little girl to defeat the monster under her bed. While an initially promising premise, the first page’s panel layout was confusing to navigate. It was complicated by two columns telling different narratives, with too little information in the individual environments to work out their relationship to one another. This wasn’t the best introduction to the series. There are also strange anachronisms in the setting. Whilst Frank and Sadie are straight out of a 1930s Hollywood film, the series has them stumbling around a world where the time period incorporates elements of the 1930s and the modern day. It’s disconcerting and thus hard to suspend disbelief. Nonetheless, the detail and colouring in the artwork are beautiful, allowing the reader to get a full sense of this vibrant world. The subtle changes in Frank and Sadie’s expressions in the Prologue also help to sell the tale of two people falling head over heels in love. However, these kinds of quirky and slightly 2D characters are most effective in small doses. 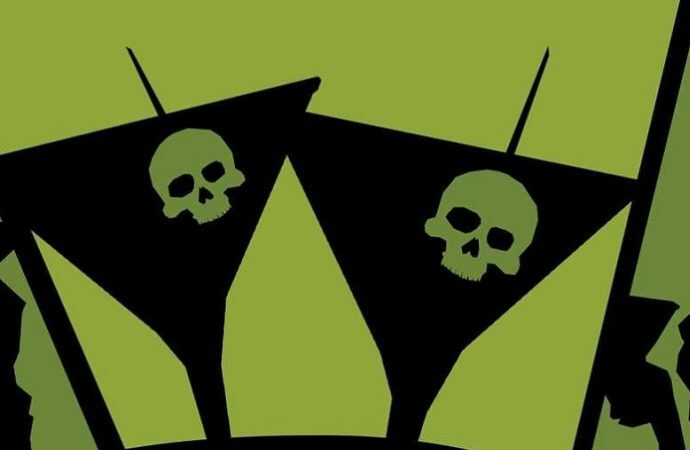 More than that, and the joke starts wearing thin and, in a comic series that stretches one connected plot over several issues, it seems laboured. A common business model in comics is to have issues act as chapters within the same plot line. It incentivises readers to buy next month’s copy and keep the series going. Forcing this structure onto Beyond Belief original storytelling format feels awkward at best. The exceptional Paul F. Tompkins and Paget Brewster played Frank and Sadie in the live shows. Acker and Blacker continue to write the characters for the comics, but without the delivery and charm of Tompkins and Brewster, the dialogue doesn’t stand up on its own. In several sections, I imagined the lines being read aloud by the actors. My experience of the comic improved dramatically. Acker and Blacker write the zippy back and forths as if they are meant to be heard aloud, but this does not work effectively in the comics as the lines need to be delivered in a certain way. It is even less effective if the reader is unfamiliar with the show. The predictable and amusing behaviour of Frank and Sadie made them popular with The Thrilling Adventure Hour listeners. Yet, in the comics, it’s difficult to shake the sense that Frank and Sadie are just insufferably smug and self-centred. This could come across in the live show, but the warm, sympathetic delivery of Tompkins and Brewster softened this. In a post-Trump world, it’s also harder to enjoy the “gadabout” antics of rich, white, privileged characters as they swan around complaining about the quality of their martinis. Still, Acker and Blacker have kept the surreal spirit and inventiveness. Of course, the haunted house isn’t just a haunted house. Of course, the death cults motives aren’t so obvious. Of course, the monster under the bed has a more complicated relationship with the little girl. Clever plot twists keep the story chugging along. Despite this, there is a problem at the heart of the comic series. It relies heavily upon the reader being a fan. Those unfamiliar with The Thrilling Adventure Hour and “Beyond Belief” may not be entirely sure why they should care about these characters. Comics have carried on the legacy of TV shows already cancelled or “finished.” Think Firefly and The Legend of Korra. Firefly gave its fans the opportunity to see where the story would go after its first season cancellation. The Legend of Korra just gave its fans some much-needed resolution and strong representation. But “Beyond Belief” had a finale. It had characters who were fun, but there were no dramatic depths to plumb, no undeveloped narratives to explore. Nothing really changed in the live show. That was the point, and not having character arcs worked for that format. It doesn’t work so well for a series of comics continuing one plot over many issues. Instead, fans may find that the comic is a poor substitute for the real thing, inciting nostalgia for the podcast. I was at first happy to see these characters continue, but a vital element was missing: fun. The Image collaboration did not seem to end well, and Acker and Blacker have stated they have been waiting a long time to continue. With this, a new “Beyond Belief” series has also just started under BOOM! Studios. Whether the frivolous charm of the individual live shows can really be depicted well in a comic format remains to be seen. A series of individual story issues could work if Acker and Blacker aren’t planning to do anything to develop these lovable if shallow characters. It would certainly be better than feeling dragged through three separate plots awkwardly stapled together.